I combine drawn and painted marks with the tactile qualities of thread, paper and fabric. The essence of the landscape and natural forms inspire my work. I use drawing to record fleeting fragments observed and absorbed; I look at the familiar, see the extraordinary and respond to subtle changes in view in the rhythmic motion of walking. The evocative moods of seasonal change and atmospheric qualities of light and changing weather experienced when walking are a constant source of inspiration. Scale of work ranges from individual hangings, wall mounted panels and framed textile artworks. I welcome invitations to give talks, workshops and courses. 22nd Oct Sketchbook workshop with sixth form students at King Alfred's Academy, Wantage, Oxfordshire. 9th Oct Presentation and demonstration to Abingdon Artists, Abingdon, Oxfordshire. 20th Sept 'Imagined seascapes- surfaces for stitch' day workshop for Bedford branch Embroiderers Guild. 18th Sept 'Land lines...' talk and presentation to Bedford branch Embroiderers Guild. 12th Sept Artists Workshop with year 10 students at Maiden Erleigh School, Reading, Berkshire. 10th Sept 'Grasses and seed heads- expressive drawing with mixed media' day workshop at Ardington School of Craft. 13th-16th Aug 'Up close in detail....abstract from elements within the landscape' a 4 day summerschool at Art Van Go, Knebworth, Hertfordshire. 8th-10th Aug 'Layers in land and seascapes' residential weekend with East Region Embroiderers Guild at Belsay Bridge, Suffolk. 28 July-1 Aug 'Land strata, elements of land, sea and sky...' a textile & mixed media approach, 5 day course at Oxford summerschool. 16th July Mixed media talk and demonstration for Wantage Art Group, Oxfordshire. 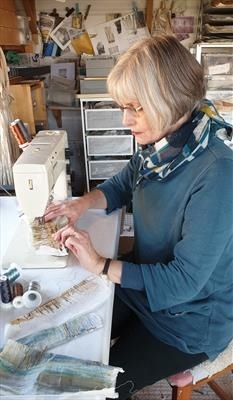 3rd July 'Take a blank canvas- texture colour &line' day workshop at Ardington School of Crafts. 26th June 'Land lines...' talk and presentationto Isleworth branch Embroiderers Guild. 19th June 'Land lines...' talk and presentation for Milton Keynes branch Embroiderers Guild. 6th-7th June 'Land lines...' talk and presentation to Leamington & District branch Embroiderers Guild., followed by 'Imagined seascapes...surfaces for stitch' day school workshop. 3rd June 'Layers in land and seascapes' day school workshop with Marlborough branch Embroiderers Guild. 29-30th April ' Creating working sketchbooks...with mixed media' a 2 day workshop at Art Van Go, Knebworth, Hertfordshire. 16th may 'Take two colours- work in abstract with mixed media' day workshop at Ardington School of Crafts. 24th April 'Imagined seascapes' day workshop at Ardington School of Crafts, Oxfordshire. 10th April 'Of land and sea...creating layered surfaces for stitch' to Winchester branch Embroiderers Guild. 9th April 'Land lines...' talk and presentation to Winchester branch Embroiderers Guild. 11th March 'Changing the surface...' creative workshop with TextileArt07 group, Chieveley, Berkshire. 3rd Feb 2014 'Land lines...' talk and presentation to Marlborough Embroiderers Guild. 2008-2014 Working freelance as an artist and tutor delivering inspirational talks to Embroiderers Guilds and individual creative workshops at Art Van Go, Knebworth, Ardington school of crafts and Embroiderers Guild day schools. 2007-2008 Art teacher, St Gabriel's School, Newbury, Berkshire. 2006 Master Class with Opus School of Textile Arts. 1989-2007 Teacher of art and textiles, St Marys School, Wantage, Oxfordshire. 1988-89 Post Graduate Certificate in Education, Bretton Hall College, University of Leeds. 1986-88 'Paint and Weaveworks' self employed working in textiles and painting. 20 Nov - 20 Dec 2010 Oxfordshire Craft Guild Christmas exhibition at Oxfordshire Museum, Woodstock. May 2010 Artweeks open studio at my home.